“By making one of the 3 strands smaller it acts as a sort of “string" to hold the other two larger strands and with the help of product, allows hair to slip up and create visual texture. It’s a similar concept to a slide up braid,” says Villa. 1. Prep Product: Redken Braid Aid 03 is specifically designed to add smoothness and grip so braids, twists and knots are easier to create and last longer. It’s a necessity!! Cover elastics with it before twisting to add a buffer to protect hair from breakage too! 2. Finishing Product: Redken Triple Take 32 is an extreme high hold hairspray without the crunch factor. It provides 24-hour control and humidity resistance so styles last longer and look better. 3. Pinning: When pinning hair up, insert the pins where fingers are holding the hair for maximum stabilization. 4. Sectioning: The amount of hair in the sections determines the size of the braid. 5. Pancaking: By using fingers to gently pull apart sections of a braid, it instantly gives the illusion of a fuller textured design. 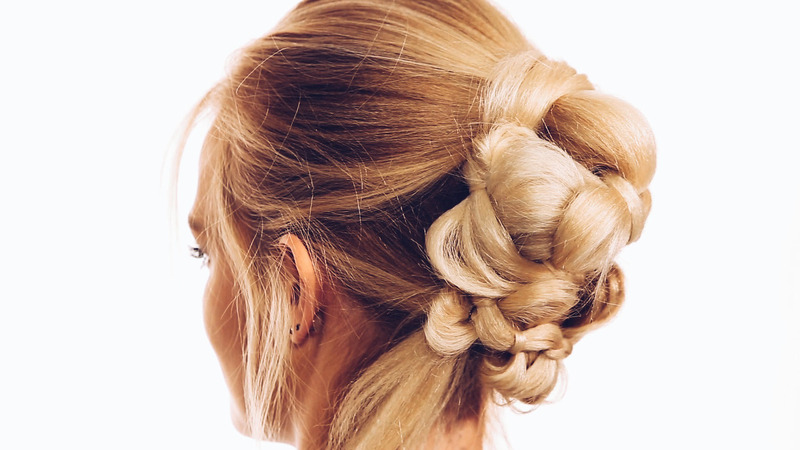 “In this look, the pancaking creates an almost curled effect…and the product used to prep and finish the braid will ensure that it stays put!” adds Villa.